The contact center has always been technically innovative. The quest to both improve customer service while reducing expenses at the same time, while potentially oxymoronic, gets pulled off in this space because of technical innovation. In fact, the contact center used to be called a call center, because, well, the only way to contact one, or to have one contact you, was to place a phone call. Contact centers were one of the first industries to really embrace IP communications because of this very reason. Today, with the advent of push to talk, email, texting, and specific smartphone apps, there are multiple contact points. Let’s take a look at the different contact center channels. Phone Call – Sometimes it’s easiest to just call in to a contact center and explain the situation verbally than to type it out in text/email/chat/etc. But before you talk to a live person, you’ll likely run into their IVR system to route you to the right department or to try to solve your problem without getting to a live person. This classic way of getting in touch with a contact center is modernizing, however, to keep pace with customer demand and expectations, especially if you’re on a smartphone. Live Chat – The number of customers using live chat support has doubled in the last two years from 14% to 28%, according to this infographic. I can understand why this is a popular option for customers and contact centers. It allows customers almost immediate access to an agent and it allows each agent to handle multiple customers at once, making the contact center more efficient. Email – Email is less immediate and isn’t the fastest platform for a conversation, but there are many benefits to email. It’s heavily automated, it’s 24x7, it’s easy to attach images/videos to demonstrate what’s happening to a service or product, and there’s clear, lasting paper trail. Text – Contact centers strive to be efficient and keep costs down without compromising customer satisfaction. So automated, proactive communication and workflow makes sense. Text messages are a great channel for automated, proactive communication and workflow. I’m also seeing it used quite a bit for security from the perspective of texting a code if you are communicating from an unknown device, or have deleted your cookies. 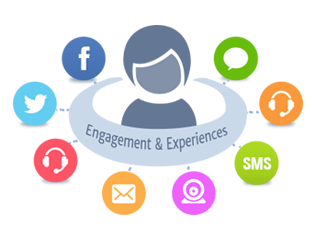 Social Media – Social media isn’t a part of a contact center per se, but a lot of people do turn to social media for customer support. Consequently, some companies have made a separate customer support social media account. It’s also the most visible of channels so it lets angry customers voice their complaints publicly and it allows the company to let the customer (and the public) know that the issues have been heard. The actual problem solving, however, happens privately in DMs or the customer is directed to a contact center. Mobile Apps/ Video Chat – Mobile apps have also made it easier for customers to interact with companies. Some apps support video chat, which helps the issue get resolved quicker. Customers can show, not tell, what’s going on with the product or service. All of these channels have to be integrated into one seamless customer experience. One exemplary industry that I think does a good job of incorporating all of the different contact center touch points is the airline industry. Next week, I’ll explain how they do that.